Located in Vienna, Virginia, approximately 16 miles from Washington DC, Wolf Trap National Park for the Performing Arts is the only national park in America dedicated to the performing arts. The Filene Center, where Friday’s show was being held, is also partially outdoors, so when dicey weather alerts started blowing up my phone, I held my breath the rain would just hang tight. 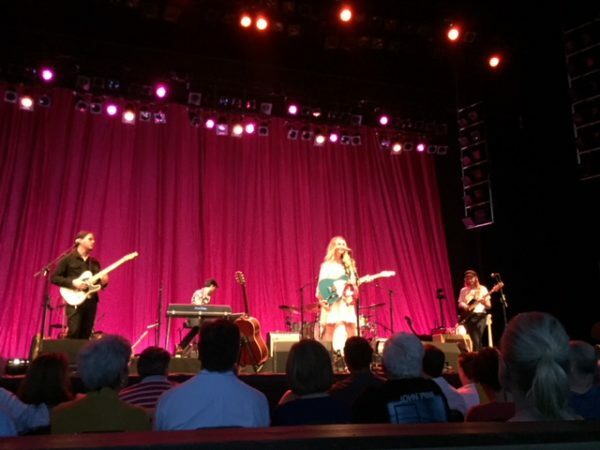 Country music darling Margo Price opened with her signature powerhouse vocals and witty lyrics, keeping the audience enthralled and captivated. 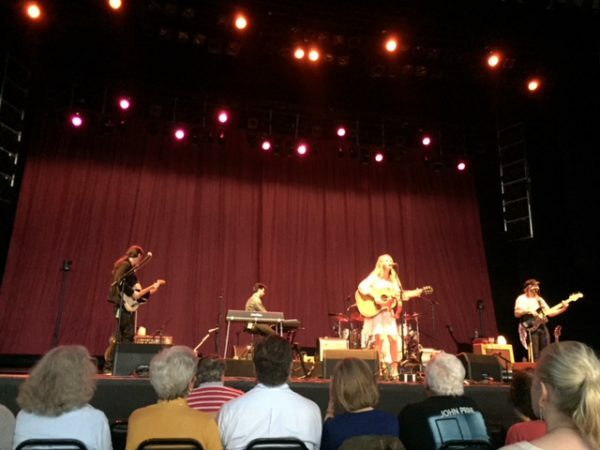 She could be described as a mix of a little Dolly, Emmylou, and Tammy with her own grit and substance. Price is one of Nashville’s most talked about new artists (although she actually isn’t “new,” Price has been paying her dues in the music scene for years) and was recently nominated for the Americana Music Association’s 2018 artist, album and song of the year awards. She’s been keeping busy performing at music festivals and late night TV shows in support of her sophomore album, All American Made. Price performed songs from All American Made and her debut album, Midwest Farmer’s Daughter, including “Do Right By Me,” “Tennessee Song,” “Wild Women,” and “Hands of Time.” She introduced the electric “Four Years of Chances” touting, “this one goes out to anyone going through a breakup or divorce,” then went straight into her hit “Hurtin’ (On the Bottle)” which she performed on Saturday Night Live in 2016. 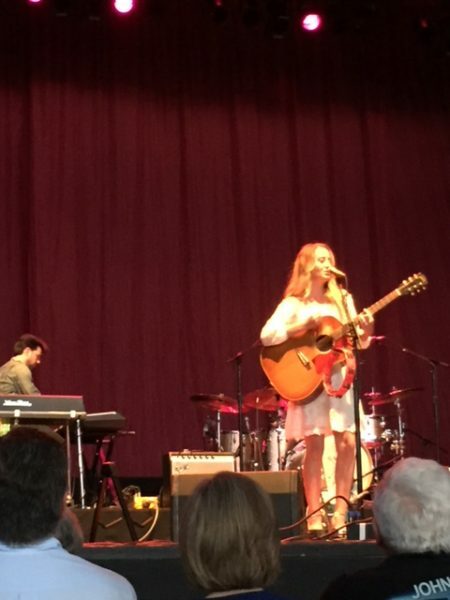 Price threw red roses to the audience after her set, while many gave her a much-deserved standing ovation. For over 50 years, the outlaw country musician, John Prine, has had a flourishing career; from multiple album releases to earning two Grammy Awards and numerous artists covering his beloved songs, including the likes of Johnny Cash, John Denver, Carly Simon and Bonnie Raitt. 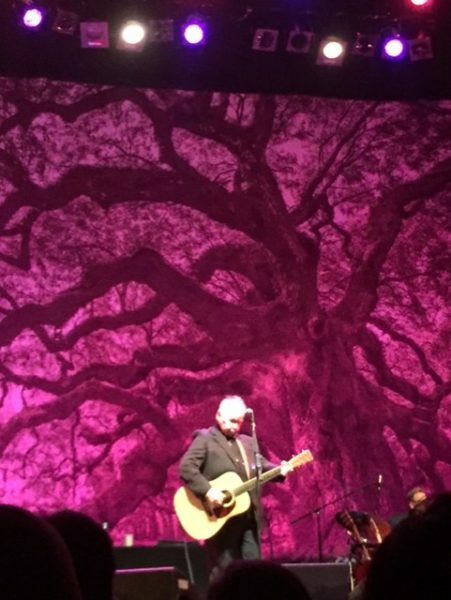 Prine’s new album, The Tree of Forgiveness, is his first in thirteen years featuring original material. The backdrop changed to the sun shining through a beautifully twisted tree. 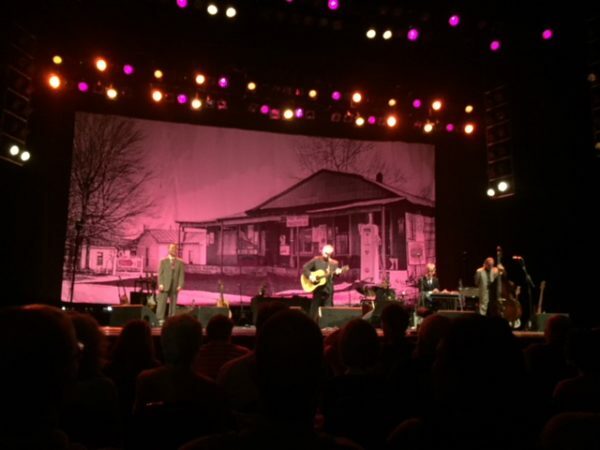 A blood red light bathed over the photograph while Prine sang “Caravan of Fools”, a lovely, quiet and haunting song punctuated with a violin. Several minutes passed while Prine had another guitar brought out-the guitar he was going to use had some tuning issues. “I bet you’re wondering why the next song is taking so long,” he said, “it just is. This is a song about my grandfather on my dad’s side, Grandpa Prine.” Prine paid homage to his grandfather with his classic, “Grandpa Was A Carpenter”, then sang one the saddest songs ever written, “Hello In There”, which I first heard in the 1980s when Michael Stipe and Natalie Merchant covered it. 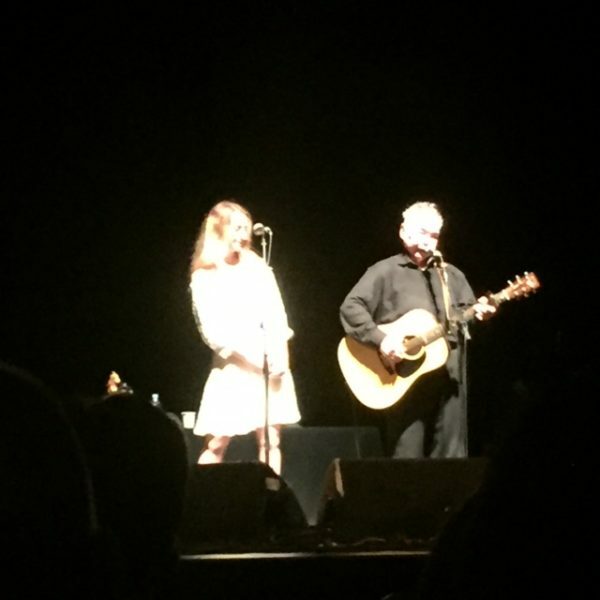 Prine has said he performs the gut-wrenching song about ageing and loneliness at every show noting that, “nothing in it wears on me.” The lyrics are so relatable and you could hear a pin drop in the venue as the audience clung to every word. Several songs from the new album were performed next including “Boundless Love”, “Summers End”, “I Have Met My Love Today”. 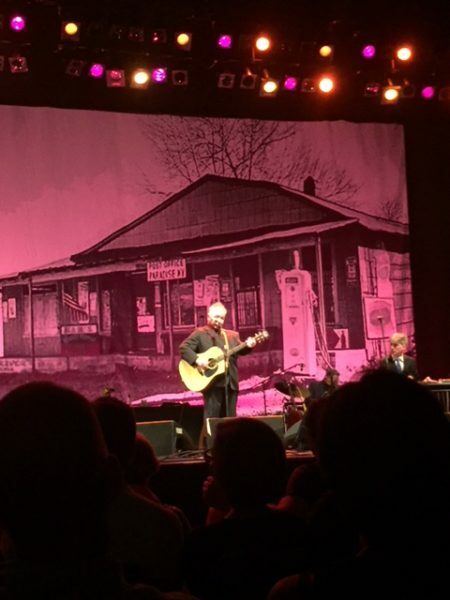 Prine’s songs aren’t very long, so he can fit a lot into a show-I counted at least 22 tonight. Number 13 was the classic “Ain’t Hurtin’ Nobody” which has this lyric: “There’s roosters laying chickens and chickens layin’ eggs/Farm machinery eating people’s arms and legs.” I’ve only heard this song a few times, but for some reason that part always stands out to me and then I don’t want to eat eggs the next day. “Angel From Montgomery” is one of Prine’s most iconic songs and it made Rolling Stone Magazine’s “100 Greatest Country Songs of All Time” list. It tells the story of a middle-aged woman daydreaming of an angel to come and take her away from the life she’s living. 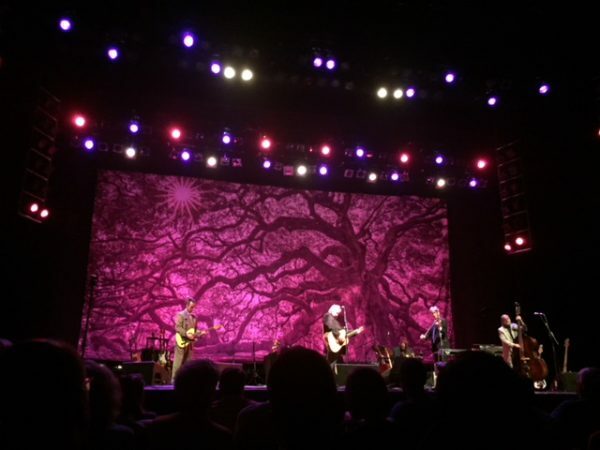 Prine introduced it as, “a song Bonnie Raitt made famous and now they sing it on all of those voice contests,” before dedicating the song to Raitt. 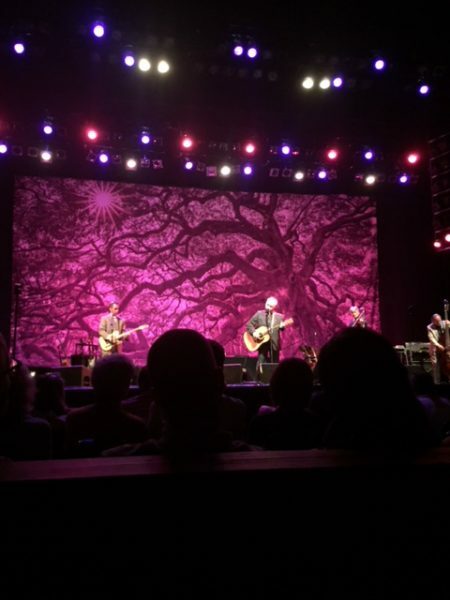 The band left the stage and Prine, dressed all in black, stood in front of a black backdrop under a lone spotlight to sing the next songs including “Everything’s Ok” and “Illegal Smile”. Prine had the audience sing the latter’s chorus by themselves: “Ah, but fortunately I have the key to escape reality/And you may see me tonight with an illegal smile/It don’t cost very much, but it lasts a long while/Won’t you please tell the man I didn’t kill anyone/No I’m just trying to have me some fun.” Margo Price came out to sing the duet “In Spite of Ourselves”, which Prine originally recorded in 1999 with Iris DeMent. “Unwed Fathers” followed, then the tragic “Sam Stone”, a heartbreaking song about a vet who comes home from “serving in the conflict overseas”, becomes a morphine addict and dies of a drug overdose. The song placed eighth in a Rolling Stone Magazine poll of the ten saddest songs of all time. “Then the coal company came with the world’s largest shovel/And they tortured the timber and stripped all the land/Well, they dug for their coal till the land was forsaken/Then they wrote it all down as the progress of man. Chills. That song just gives me chills and its message still resonates today. As Prine walked offstage the audience gave him a standing ovation while the rain barely held off until everyone began to head towards their cars. As it started to drizzle, several people burst into an impromptu sing-a-long and I think one day we’ll all whistle and go fishing in heaven-doesn’t sound too bad Mr. Prine.